We offer FOUR options for financing a purchase from Stillwell Sales LLC. Please see the options below. Currency Capital's Express Financing. Click the green button to the left to fill out an application. 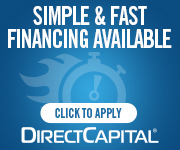 Financing is available for all types of purchases with Direct Capital. Click on the image to the left fill out an application today. **Northland Capital- Click here for more information. "As a direct lender, Northland Capital provides fast, easy and flexible finance and equipment leasing solutions to diverse industries with a variety of equipment needs." "How? It's simple. Our retail finance programs are straightforward and easy. And, our innovative variety of promotional choices, friendly and timely service, quick-minute credit decisions, loan contract assistance and prompt payments are unmatched in our industry." Please click HERE to see what brands they will finance. Contact Jon (785) 738-0340 for more information.